The greenlight 300™ has been developed to provide a reliable and accurate alternative without mercury. This is achieved using silicon chip technology replacing the traditional mercury column with an electronic pressure detection system. Validated to the ESH International Protocol by the Mayo Clinic. 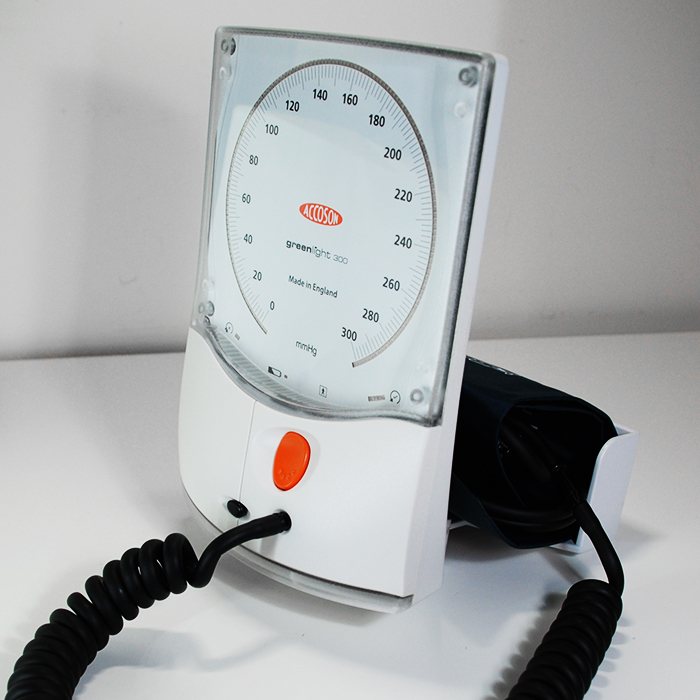 It is also sold as a test reference manometer for calibrating and checking aneroid devices – chosen by leading pharmaceutical companies for their testing services in the UK. There is a risk of toxic effects when mercury is spilt, meaning mercury sphygs must be handled with care, health and safety measures must also be in place to deal with spills appropriately. Increasing concerns about mercury contamination have led many people to look for a mercury alternative. The difficulty has been finding an accurate, reliable alternative and concerns have been expressed by many experts about the replacement of the mercury sphyg in clinical practice with potentially less accurate devices. 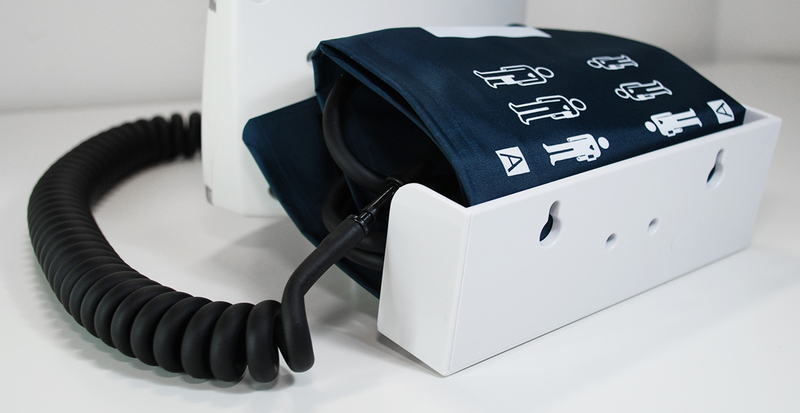 Overcoming problems associated with other types of sphygmomanometer: it is non‑toxic, robust and most importantly, automatically self-calibrates to zero when switched on, thus ensuring reliable accuracy. The traditional mercury display is replaced with LEDs clearly displaying pressure in steps of 2 mmHg, and the clinically important cuff pressure deflation rate is indicated. 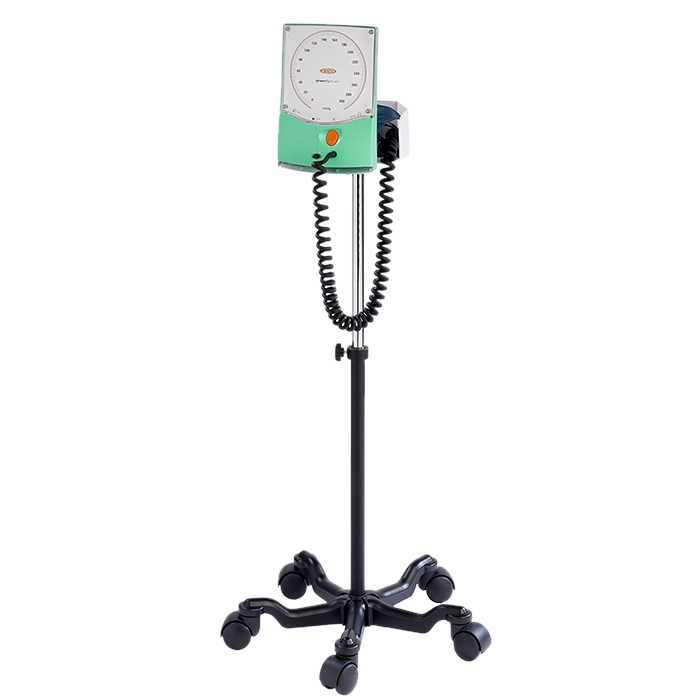 Shown to be compliant with the US standard for non-automated sphygmomanometers, ANSI/AAMI SP9:1994, and has been approved by the FDA (K040410). It has also been shown to be compliant with the European standards EN1060-1, EN1060-2 and EN1060-3. A swivel mounting bracket which allows the instrument to be turned in two directions allowing the display to be easily viewed. 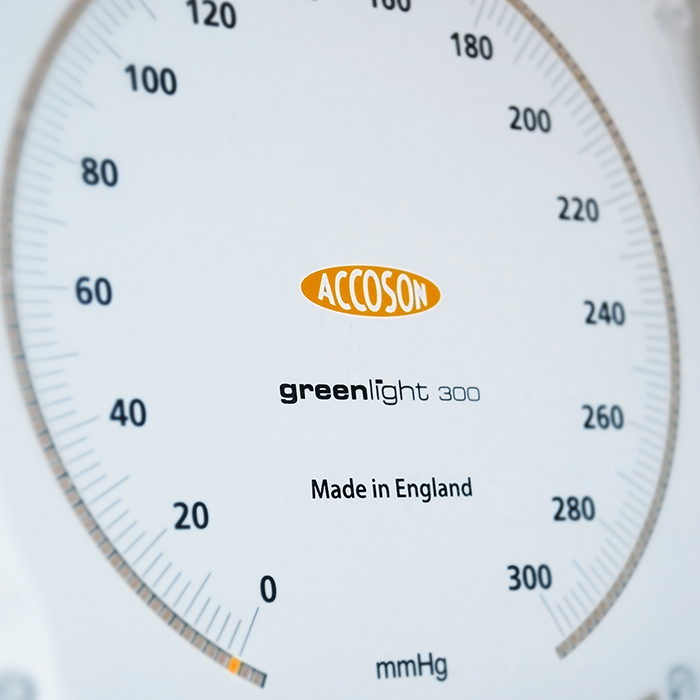 The greenlight 300 will automatically switch off after one minute of not being used, provided the cuff pressure remains below 20mmHg. If a residual cuff pressure of over 20mmHg is maintained (in the case of continual readings) the device will stay switched on. The greenlight 300 will switch itself off if it is subjected to abnormal conditions, such as a significant change in temperature. The device will stabilize and may then be switched on again, when the normal self-calibration will take place. If the greenlight 300 is switched off when there is pressure in the cuff, and then switched on again, it will automatically recalibrate itself to zero and then indicate the residual cuff pressure. The greenlight 300 takes four AA/LR6 alkaline batteries. These will last for over a year in typical hospital ward use. Use of rechargeable batteries is not recommended. The greenlight 300 does not need to be vertical or in any particular orientation when in use. There are no moving parts to affect the accuracy. When the low battery warning indicator comes on continuously, the greenlight 300 cannot be used and the batteries need to be replaced immediately. The greenlight 300 will automatically self-calibrate to zero each time it is switched on. This calibration will only need to be checked after four years. Other components should be examined regularly for signs of wear, this will ensure continuing measurement accuracy. Wipe the device with a damp cloth, soaked in hospital detergent. Do not let water into the battery compartment or the device itself. If water enters the battery compartment, remove the batteries immediately and leave the device to dry thoroughly before reinserting them. 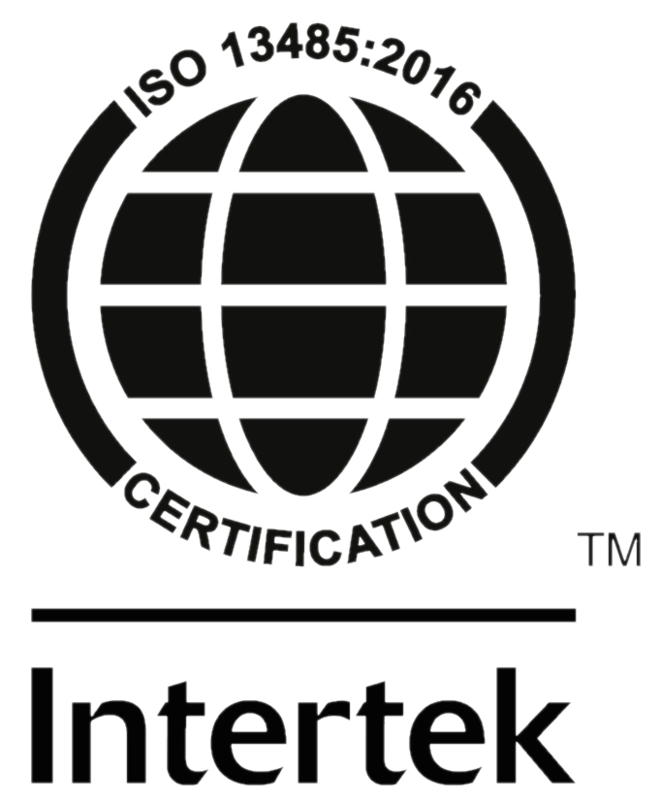 Our quality is guaranteed, as we are certified to ISO 13485:2016, the world’s most popular standard for medical device quality management. This specifies requirements for a quality management system where an organisation needs to demonstrate its ability to provide medical devices and related services that consistently meet customer and applicable regulatory requirements.